The asteroid or comet that created the Australasian tektites approached at an oblique angle, probably below 30 degrees inclination relative to the Earth’s surface. The cosmic body is interpreted in this work as coming from the north-northwest, travelling to the south-southeast at most likely 164 ±2 degrees azimuth and impacting in the general Indochinese-Hainan area. The source crater probably lies in the Gulf of Tonkin between Vietnam and Hainan, China, or in the northern part of the Gulf of Tonkin, offshore Vietnam (Ma et al., 2004 and Glass and Koeberl, 2006). The size of the impact generated principally depends on the size and density of the impactor and the velocity it was travelling at. Therefore the same impact results can be obtained by a large body travelling at slower velocities or a smaller body travelling at higher velocities. Tektite production is likely enhanced by higher velocity impacts. Glass (2003) estimates the Australasian Crater to be around 40 km in diameter. Lee and Wei (2000) estimate the crater to be 116 to 90 km in diameter. This may be an over estimate given that the event does not appear to be global. In order to form a 40 km diameter crater in sedimentary rock with a 25 degree impact angle an icy comet travelling at 50 km/sec would need to be 3.8 km in diameter whereas a dense asteroid travelling at 17 km/sec would need to be 4.4 km diameter. At higher angles of impact the size of the body required decreases slightly for a set velocity (Collins et al., 2005). In a cosmic collision, the silica-rich melt is ejected from the impact site in a sheet-like fashion, or ejecta curtain, before being disrupted into isolated ‘tektite’ melt droplets. At medial distances and beyond, the tektites effectively exit the atmosphere, suffering variable degrees of plastic deformation in the process, then, for the most part, re-enter the atmosphere as solid glass bodies. Close to the impact site these ‘tektite’ melt droplets never truly exit the atmosphere and the molten bodies suffer significant plastic deformation by interaction with the atmosphere. The many unique tektite morphologies are linked with distance from the impact site. The primary tektite morphology should be defined as the initial shape of the tektite, formed by disruption of the melt and defined by cohesive and centrifugal forces, prior to interaction with the atmosphere and exposure to aerodynamic forces. One can think of these morphologies as equivalent to those formed in a vacuum such as space. As we shall see, however, tektites were not typically formed in a total vacuum and thus the primary morphology must be artificially differentiated from the contemporaneous and subsequent aerodynamic modifications (as applicable). The aerodynamic influence on the molten primary body will be to a greater or lesser extent dependent on density of the atmosphere and velocity of the tektite vs. cohesive forces (surface tension), which increases with viscosity. The traditional view, based on australites, that primary morphologies form, then cool, then re-enter, ablate and spall is somewhat over-simplistic in approach. Two schools of thought exist with regards primary shape formation, and indeed what actually constitutes a primary shape is questioned. This results in some degree of overlap with the subsequent plastic deformation chapter in terms of initial explanation. True primary shapes are spheres, spheroidal dumbbells and spheroidal teardrops and everything inbetween. They are effectively the original morphology as if formed in a vacuum. In reality, even as tektites were forming, most were being modified by atmospheric interaction. The primary shape is therefore only very transient. The forces that could potentially (but do not necessarily) influence the morphology of the tektite are listed below, with brief explanation, and depicted in the figure below. It is noteworthy that the effect of the interplay of forces on the body may depend on other factors including viscosity of the melt (more force required to modify a higher viscosity melt) and mass of the tektite globule, with mass increasing the inertia (resistance to change, i.e. you'll need a stronger force to make the same change to velocity/direction of travel in a larger body). 1) Ejection forces: The tektite melt is ejected by the force of the impact. The first formed, distal then medial, down-range, tektites conserved much of the momentum of the impactor. One can think of a ball hitting another ball and projecting it forwards, in simplistic terms. The last formed proximal tektites, ejected in all directions including up-range, were formed by an explosion as the circular impact crater began to open up. The tektite melt is ejected as a massive curtain until other forces, such as gravity and aerodynamic, kick-in and disrupt the melt into isolated droplets. An ejection velocity that is too high, in the presence of other forces such as aerodynamic forces may cause significant break-up of the melt (dependent on viscosity) and therefore not yield larger tektites. The ejection velocity, combined with any deceleration during atmospheric exit, determine the re-entry velocity. Higher velocities, on encountering aerodynamic forces will result in greater heating and ablation in the distal setting. 2) Gravitational forces: So long as the tektite is travelling at below the escape velocity, the force of gravity will bring it back down. Obviously the interplay of ejection velocity and gravity are important in determining where the tektite ends up. 3) Cohesive forces are the mutually attractive forces that exist between like molecules of a particular liquid (JRank Article 1182). Cohesive forces give rise to surface tension, which resists deformation from spherical. A molecule on the surface of a liquid is pulled by the molecules below it and to its sides. The net force on this surface molecule is inward. The result is a surface that behaves as if it were under tension. If a liquid drop with an irregular shape is created, the inward forces acting on the molecules at its surface quickly pull it into the smallest possible volume it can have, which is a sphere. (JRank Article 6625; McDonald, 1954; Elkins-Tanton et al., 2003; Stauffer and Butler, 2010). Cohesive forces also give rise to capillary action, which is the cohesion of molecules of a liquid to each other and adhesion of these molecules to the surrounding material. (JRank Article 1182; Elkins-Tanton et al., 2003; Aranyosi, 2010). Capillary length is the length beyond which gravity becomes important and the drop loses its spherical shape and flattens out. In a falling drop, drag forces eventually balance gravity. In order to have a spherical droplet in this situation the hydrostatic pressure/force in the drop should be negligible compared to surface tension forces. As the radius of the drop increases, and exceeds the capillary length, hydrostatic pressure/force exceeds surface tension forces and the drop flattens out (and with increasing size cascades to smaller bodies) (Lautrup, 2010). In tektites that are being ejected (as oppose to falling under gravity) hydrostatic pressure may be replaced with deceleration pressure. (See hydrostatic forces and deceleration forces below). Viscosity, although not a force, viscosity heavily influences cohesive forces (surface tension) and is therefore important to mention. As viscosity increases there is greater resistance to deformation and cascading. Tektites are continually cooling and becoming increasingly viscous (Elkins-Tanton et al., 2003; Stauffer and Butler, 2010). Cooling is an exceedingly important concept and explains the presence of larger tektites. If one ignores the effect of cooling in molten glass then tektites should be of similar size to raindrops or much smaller (Elkins-Tanton et al., 2003). 4) Centrifugal forces: Rotation forces material away from the center of the body, towards the edges. Stable axisymmetrical rotation about 1 axis (rolling) results in discoidal forms. Subsequent unstable non-axisymmetric rotation about 2 axes (tumbling) will result in dumbbell forms and prolate forms being generated from centrally thinned and non-centrally thinned bodies, respectively. (Elkins-Tanton et al., 2003; Stauffer and Butler, 2010). 5) Aerodynamic forces: The highest pressures are at the center of the anterior (McDonald, 1954), termed the stagnation point, and may create an anterior concavity (punt). Shear over the anterior, sides and posterior may set in motion internal vortices, trending the morphology towards biconcave (McDonald, 1954; Baumann et al., 1992). Vortices are, in part, controlled by cohesive forces. 6) Hydrostatic forces: Think collapse of a column of water to a puddle under gravity, creating a flattening of the body (McDonald, 1954). This force may be largely irrelevant in high velocity tektites, but has a similar effect to deceleration forces. 7) Deceleration forces: resulting from aerodynamic drag, cause the body to flatten (Chapman, 1964) against a surface (air included). If a tektite is formed within the realm of the atmosphere (and most were likely developing from the jetted melt at high altitudes within an exceedingly thin, but significant, atmosphere) then the primary morphology is immediately flattened by atmospheric interaction. We move on from the Primary Shape to the secondary Plastic Deformation shapes. ABOVE: Various forces acting upon a molten tektite globule. A) Cohesive forces (surface tension) try to maintain a spherical body. The body will be spherical in the absence of other significant forces (JRank Article 1182). B) In a dumbbell or biconcave disc cohesive forces attempt to form spherical shapes (via an apioid) or spheroidal cross sections, respectively. C) A tumbling motion of a molten body will result in a spherical form as cohesive forces dominate. D) A rolling motion will result in flattened oblate spheroid, disc, biconcave disc (shown) and tori due to centrifugal forces exceeding cohesive forces (Elkins-Tanton et al., 2003; Stauffer and Butler, 2010). E) If this rotating biconcave disc then tumbles a dumbbell will form. If a biconvex form formed by rotation then tumbles a prolate body will form, such as a rod or bar (Elkins-Tanton et al., 2003; Stauffer and Butler, 2010). F) Stationary, on a solid surface or in flight acting against other aerodynamic forces, the molten body will flatten out due to hydrostatic pressure (McDonald, 1954). G) The body will also flatten out due to deceleration pressure. This can arise during atmospheric exit and re-entry (if molten) (Chapman, 1964). H) Aerodynamic forces have the highest pressure at the stagnation point, in the centre of the anterior (McDonald, 1954) causing an inward bowing termed a 'punt'. I) Aerodynamic forces - shear forces between the air and molten tektite may set up vortices within a tektite (after Baumann et al., 1992). J) These vortices would ultimately lead to biconcave discs and then unstable tori (after Baumann et al., 1992). The traditional view held is that primary morphologies comprise spheres, variably prolate spheroids, spheroidal dumbbells and spheroidal apioids, which are formed by tumbling. In the distal setting these spheroidal morphologies were then believed to undergo ablation and spallation. The medial setting was not studied in any classical literature, but assumptions made that spherical bodies underwent spallation. The proximal setting was not studied in any detail and deformation was commonly considered to occur either on the ground or in the atmosphere (Nininger and Huss, 1966). Many issues are derived from this historical perspective, based almost solely on distal australites, assumed to have re-entered as perfect cooled glass spheres: A reasonably logical conclusion (ignoring any explanation as to why all australites are oriented). Once medial and proximal tektites are studied, which were predominantly not derived from perfect spheres, a review of evidence and re-think as to whether australites where spherical prior to re-entry is necessary. A new perspective on primary tektite morphologies began with Elkins-Tanton et al. (2003) who believe that primary morphologies also encompass flattened bodies such as discs, biconcave discs and tori. It was demonstrated that these forms will arise by rotation about one axis, termed rolling. A sphere evolves into an oblate ellipsoid, then to a disc and and eventually to biconcave forms. As angular speed increases further, the cohesive forces cannot counter the centrifugal forces and tori form (Aussillous and Quéré, 2004). The resultant morphology is a balance between the centrifugal forces making a disc to tori and cohesive forces (surface tension) pulling the body back to spherical. 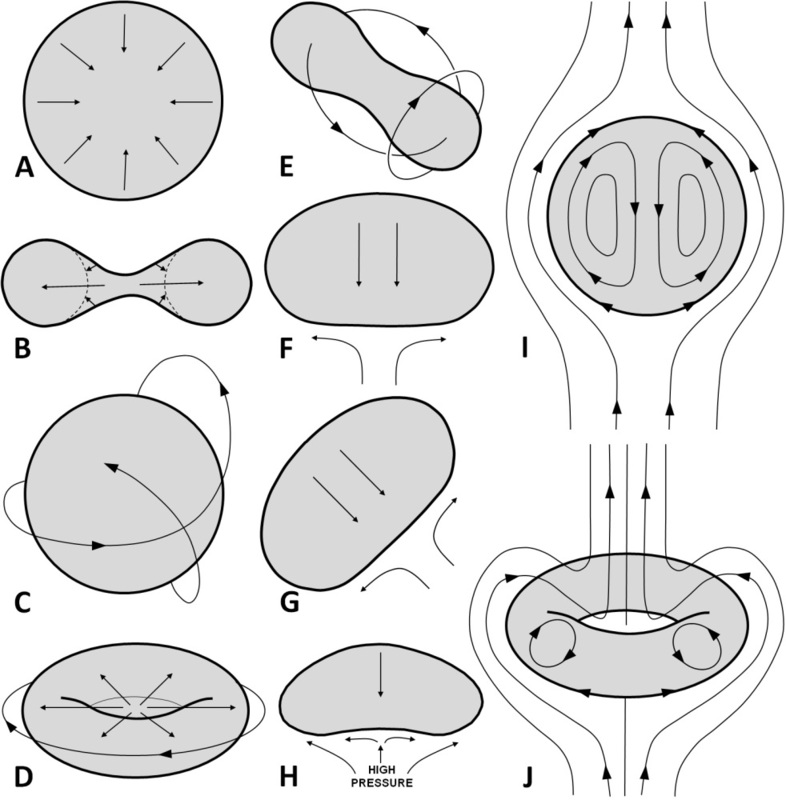 If these forms then tumble, rotating about more than one axis, then these 'flattened' morphologies will evolve from convex discs to prolate ellipsoids, from biconcave discs to dumbbells and then from dumbbells to teardrops. Based on a handful of actual tektites it was concluded by Elkins-Tanton et al. (2003) that 'all known' tektite morphologies could be produced by rolling and tumbling mechanisms. ABOVE: The conflicting views of splashform morphology formation can be summarised in the above biconcave indochinite teardrop. The arrows depict centrifugal forces by rolling (left arrows) versus vortex motion caused by deceleration and shear forces, or collectively 'aerodynamic' forces, (right arrows). This specimen is from north-eastern Thailand and weighs 103.9g (67x60x22 mm) (Catalogue # IT1112527). Note that the tail cooled faster than the bulbous body and hence was not fully re-absorbed into the body. Note the etched schleiren show only very slight spiralling around the tail. The work of Elkins-Tanton et al. (2003) was followed up by Stauffer and Butler (2010) and Butler et al. (2011) who examined 150 specimens and took measurements of 1,200 specimens from 'Ebay' internet auction sellers. A classification scheme was established based on the measurements, but somewhat influenced by the forms anticipated from Elkins-Tanton et al. (2003). Specimens were first divided into 'main-field' (all spherical, discoidal, elongate and dumbbell forms) and non-main-field (teardrops). The main-field specimens were next divided into bodies with 'no central thinning' and 'centrally thinned bodies'. These two groups were then classified on the basis of length/width vs. width/thickness. Teardrops were similarly classified on the basis of length/width vs. width/thickness, but with no initial division based on central thinning. The length/width vs. width/thickness classification is excellent, but the scheme has shortcomings in that rather than relying solely on the tektite morphologies and dimensions a large assumption has been made that the mechanism of formation proposed by Elkins-Tanton et al. (2003) is correct. Tektites that do not fit this model have therefore not been properly classified. Whilst these works are accurate in their mathematics and production of theoretical morphologies, the fundamental problem is that these schemes do not correspond to all true tektite morphologies, just the forms assumed to exist from classic literature and a small set of examples. Stauffer and Butler (2010) probably studied the minimum number of specimens required to get a general impression of the assemblage (excluding the very rare, sometimes tell-tale forms). Importantly, Stauffer and Butler (2010) recognised common proximal class of concavo-convex tektites, which do not fit the model in it's purest form. In classifiying these, the concavo-convex forms are rather unsatisfactorily perched between the main-field sub-divisions ('no central thinning' and 'centrally thinned bodies'). A varied collection of teardrops (including some, not all, flattened forms) were recognised. Despite this, the non-main-field 'teardrops' were not also divided into 'no central thinning' and 'centrally thinned' bodies. Disappointingly the teardrops were not explained with 'an analysis of the physics of their formation left for later study'. Medial and distal tektites, which evolved from primary morphologies, were given cursory mention and it was not established whether they fitted the proposed formation mechanism. Discs are not primary shapes. Why? Well discs only occur in the proximal setting were tektites formed at the lowest altitudes. If they were a true primary morphology then we would see discs at proximal and medial locations. In addition teardrop-discs are not explained by the model (and in fact contradict it) and subtle morphological details of discs disagree that discs formed primarily through centrifugal forces as primary bodies - features indicate atmospheric interactions. A better approach would have been to independently and in an unbiased way classify the 'exit' morphologies (solidified morphologies prior to re-entry, so excluding ablation and spallation effects) of proximal, medial and distal forms. Then, from the established morphologies and known forces that could potentially act on the body, propose a mechanism of formation. The author has examined many hundreds of kilos of tektites in the proximal, medial and distal settings. 1) In all bodies (spheres, prolate bodies, dumbbells, teardrops) there is an apparent evolution from spheroidal to ellipsoidal to biconvex, plano-convex, concavo (anterior)-convex, biconcave and ultimately tori. Tori are always fragmented when found. 2) To emphasise the above, all bodies (including teardrops) can be flattened, not just originally spherical forms. The figure above demonstrates a biconcave teardrop. 3) In teardrop forms the slender tail cools first due to high surface area to volume. This prevents re-absorption of the tail. Commonly, following natural etching, one observes schlieren radially extending from this tail. These schlieren, which represent flow within the tektite body, usually show very little spiralling and those rare teardrops that exhibit clear spiralling command a high price. 4) In flattened teardrops the neck of the teardrop can be attached to the body anywhere from the centre to the edge. It has not been spun to the edge. 5) In the proximal setting contorted or 'bent' teardrops and occasionally 'bent' dumbbells are observed. 6) Some slightly etched, but well preserved, specimens show a subtle circle on the posterior surface. This might be a reflection of internal vortice flow. 7) The central anterior punt (concavity) is often not perfectly central, but offset to one margin implying that the force that created the punt was not even in all directions. 1) In all bodies (spheres, prolate bodies, dumbbells, teardrops) there is an apparent evolution from spheroidal to ellipsoidal to biconvex. 2) Dumbbells are typically spherical or very close to spherical on their short axis, the flattened indochinite dumbbells are not observed in the medial setting. 3) Concavo-convex, biconcave and tori have never been observed despite examination of many hundreds of kilos of specimens. Biconcave specimens would remain unmistakable after spallation, if they existed. 4) The majority of specimens re-entered as oriented ellipsoidal forms. Occasionally specimens re-entered as un-oriented spheres. 5) Teardrops, which are rare, are sometimes slightly contorted in terms of the tail pointing towards the posterior. Dumbbells are not contorted. Overall there is very little contortion of these bodies. 6) Some slightly etched, but well preserved specimens show a circle on the posterior surface. This might be a reflection of internal vortice flow (see Figure below). 7) Medial tektites form the largest of the splashform tektites. ABOVE: The posterior surface of two philippinite cores showing a circular schlieren. This is also common place in lightly etched australites and indochinites. The flow pattern may be important in determining how the molten specimen was flattened. LEFT: Posterior view of a 66.3 gram philippinite from Sipalay, Philippines. RIGHT: Posterior view of a 56.0 gram (49.5x39x28 mm philippinite from unknown locality (Catalogue # PX1117133). 1) Some larger bodies are recorded as being ellipsoidal (Chapman and Larson, 1963; Baker, 1972). 2) Smaller bodies appear spherical when measuring the small, insufficient, remaining posterior surface. In truth, despite the spherical appearances, bodies could be spherical, ellipsoidal, biconvex or slightly plano-convex and still appear spherical in measurement. 3) Practically all australites are oriented from the beginning of re-entry, highly suggestive that they were not perfectly spherical bodies. Heterogeneity within the tektite would be required in order to orient a perfect sphere. Most specimens are homogenous. 4) Plano-convex, concavo-convex, biconcave and tori have never been observed despite examination of tens of kilos of specimens. A single exception of one tori exists (McColl, 1997), which is probably not of primary origin. 5) Some slightly etched, but well preserved specimens show a circle on the posterior surface. This might be a reflection of internal vortice flow. Melnik (1991) reports that the internal striae from a sectioned australite from Pine Dam appears to show a toroidal vortex. 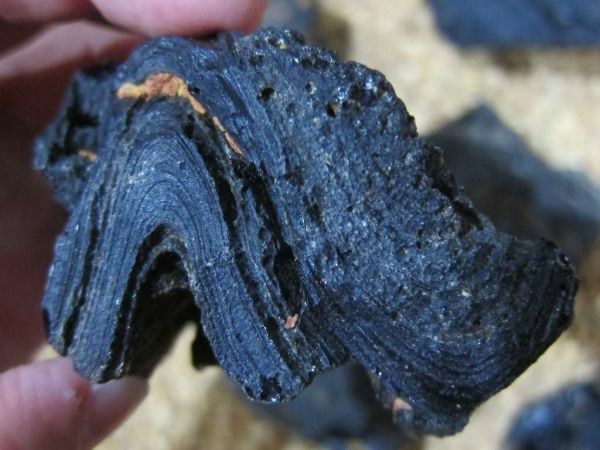 This internal flow structure suggests the tektite was subject to external drag prior to solidification and re-entry. 6) Australites are typically small. The interaction of centrifugal forces with cohesive forces (surface tension), with cohesive forces being increased by viscosity, which increases as the tektite cools, is established as being present; but to what degree is questioned. Whilst Elkins-Tanton et al. (2003) and Stauffer and Butler (2010) argue that these forces account for all known tektite morphologies, the author questions this and therefore questions the relative importance. Aerodynamic forces that could act upon the body must also be examined. By examination of the pressure of bubbles trapped within tektites a crude idea of formation height can be established. As the tektite climbs atmospherically the bubbles within a tektite will expand as per surrounding atmospheric pressure until the molten glass has become sufficiently viscous or solid on the exterior to resist further change and ‘lock-in’ the atmospheric pressure at that height. Distal australites have bubble pressures corresponding to 40 km altitude (McColl, 2008) from the least viscous melt at the highest velocity and lowest ejection angle. Medial philippinites have bubble pressures corresponding to 40 km (Suess, 1951), 44.5 km (Zähringer and Gentner, 1963) and 40-50 km (Matsuda et al., 1996; with this representing a lower limit in Mizote et al., 2003) altitude and intermediate parameters. Proximal splashform indochinites have bubble pressures corresponding to 12 and 22 km altitude (Müller and Gentner, 1968) from the most viscous melt at the lowest velocity and highest ejection angle. The atmosphere is rarefied at 40 km plus with over 99% of the atmosphere below this level (Lutgens and Tarbuck, 1995). Molten tektites, however, were travelling at hypervelocity (probably in the range of 2 to 7 km/sec as calculated from ballistic trajectories utilising Ballistic Simulator "Orbit 1.2" software that ignore drag, so this is probably a low estimate for initial velocity). So, despite the very thin atmosphere, at these hypervelocities tektites would have undoubtedly experienced aerodynamic drag. Whether aerodynamic forces influence morphology or not will depend on the interplay with viscosity, which influences surface tension, and the atmospheric density and tektite velocity. There are two mechanisms in nature that can transform a spherical liquid body into a tori (or anywhere inbetween the two). The first is centrifugal forces being acted against by cohesive forces (surface tension) first described by Plateau (1873). The second is aerodynamic forces, principally shear forces setting up internal vortices (think smoke ring) and ‘flattening’ deceleration pressures acting against cohesive forces (surface tension). Vortex rings were first discussed by Thomson and Newall (1885) and some excellent illustrations are to be found in this publication. These two different forces can effectively produce very similar morphologies via a centrifuge/rolling or via internal vortices. It is therefore essential in tektites to observe the subtleties in morphology to determine whether it was the former, latter or combination of above mechanisms that results in the observed morphologies. In the proximal setting we observe spheroidal, ellipsoidal, biconvex, plano-convex, concavo-convex, biconcave forms and toroidal fragments. All of these forms can be derived from aerodynamic forces acting on a body. The rolling mechanism, on the other hand, does not account for plano-convex forms or concavo-convex forms, unless these very common forms are considered imperfections of the rarer biconcave morphology. A combination of rolling, followed by aerodynamic forces could be used to account for these morphologies. Next, if we look at medial and distal tektites a problem is encountered. Distal forms are off-spherical to ellipsoidal re-entry bodies. Or, taking the traditional view (which does not account for their orientation), they were mainly spherical bodies. Medial bodies can be readily measured. 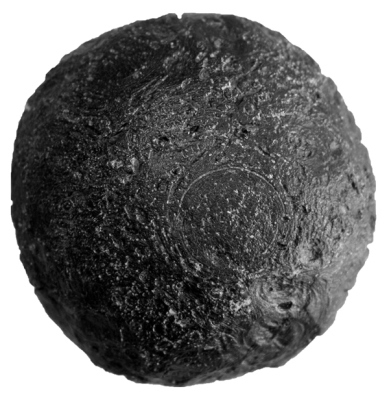 The vast majority of medial forms were flattened spheres: Ellipsoidal to perhaps biconvex forms. Rarer medial tektites were perfect spheres and had no orientation during re-entry. The absence of the more flattened bodies, such as concavo-convex, biconcave and toroidal bodies is enlightening. Spheroidal dumbbells are not uncommon in these medial assemblages, yet these are believed to be derived from the biconcave, centrally thinned, bodies (Elkins-Tanton et al., 2003; Stauffer and Butler, 2010). One also observes occassional non-saddled prolate forms which supposedly evolved from discoidal forms. So, by this mechanism, every single biconcave form, without fail, formed a dumbbell, yet most discoidal forms failed to evolve to prolate forms. Why are centrally thinned, supposedly transitional, bodies never found in the assemblage? It could be argued that the longer liquid life and lower stability of these bodies might account for their total absence. Another, perhaps more feasible argument, is that these biconcave/toroidal forms are not genuine primary morphologies. That is why biconcave/toroidal forms only occur in the proximal setting where bodies formed at lower altitude and consequently aerodynamic forces would have been significantly higher. If one assumes aerodynamic forces acted on these bodies then it must also be applied to other bodies. Furthermore, there are unstable morphologies that are produced by the rolling mechanism. These include 3, 4, 5, and 6 lobed forms (Tagg et al. 1980; Aussillous and Quéré, 2004; Heine, 2006; Hills and Eaves, 2008; Lü et al., 2010). As the number of lobes increases, so does instability (Lü et al., 2010) and Elkins-Tanton et al. (2003) considered all multi-lobed (3+ lobe) forms unstable. Multi-lobed forms are never observed in tektites. Flattened teardrops present a further problem. Dumbbells have been demonstrated to be produced by a rolling motion creating a centrally thinned disc, followed by a tumbling motion to create a dumbbell. Teardrops are derived from the splitting apart of dumbbells at higher speeds of rotation. Teardrops are end forms in the rolling and tumbling model. 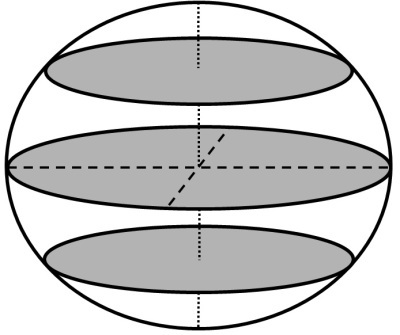 What we observe, however, is a full sequence of spheroidal, ellipsoidal, biconvex, plano-convex, concavo-convex and biconcave teardrops, indentical to the spherical-disc sequence. In these flattened teardrops the tails cooled the quickest, whilst the bulbous ends took longer to cool and therefore suffered greater deformation. The positioning of the tails is random and can be anywhere from central, as in the case of ‘Hershey’s Kisses’, or to the side, but always swept towards the posterior. Tails have not been ‘spun’ to the sides of the discs, implying a lack of centrifugal forces. Commonly tektites have undergone some degree of etching. This allows us to study the external expression of the internal schlieren or flow lines. The internal flow lines around the tail probably formed as the parent dumbbell split in two. Some teardrops clearly exhibit ‘spinning’ whilst in many the spiraling of flow lines appears to be minimal. Teardrops present a clear problem to the rolling and tumbling mechanism, hence the lack of explanation in the literature. In this mechanism the initial rolling motion, which created a biconcave disc, must have become tumbling to produce a dumbbell and then returned to rolling to produce a flattened teardrop. Even this improbable sequence of events fails to explain all the morphologies and fails to explain the positioning of the tail and why the tail is always swept to the posterior. Aerodynamic forces explain all observations. In the proximal setting and very rarely in the medial setting (although not nearly as well developed) we see arciform or distorted/bent teardrops and dumbbells. In teardrops the tail is always swept to the posterior. In dumbbells the two lobes often bend towards the anterior with an arc, equivalent to a concavity or ‘punt’ in a disc, developed over the anterior. Effectively ‘open’ convex on the posterior and ‘open’ concave on the anterior. These morphologies appear to be problematic to obtain by means other than aerodynamic. These forms cannot be attributed to ‘freak’ bending whilst splitting, they follow clear and repeatable patterns. ABOVE: A table listing the principal tektite re-entry morphologies (prior to ablation and spallation) plus some theoretical shapes produced by centrifugal forces. The occurrence of the morphology in the proximal, medial and distal setting is noted. The possible mechanisms by which the shape could arise are then noted. These are rolling and tumbling motions and aerodynamic (and deceleration) forces or combination thereof. One should note that spherical or spheroidal bodies do not have an aerodynamic influence. More importantly concavo-convex forms are not formed by rolling and tumbling mechanisms alone. Concavo-convex, biconcave and toroidal forms are not observed in medial and distal settings. The unstable two to six lobed disc configurations, formed by centrifugal forces, are not observed in tektites. ✓ = occurrence / possible mechanism, o = non-occurrence / mechanism does not explain observed morphology. ? = possible occurrence. It is clear from observed bubble pressures and calculated ballistic trajectories and velocities that theoretically aerodynamic forces should play a role in the shaping of tektites. Furthermore, some of the observed morphologies, such as concavo-convex forms, cannot be produced in a rolling model alone: aerodynamic forces are required. These forms are not ‘freaks’ but a main-stay of the proximal tektite assemblage. As soon as aerodynamic forces are concluded then they must be factored in across the board. It is long established that rotation played a role in the production of primary tektite morphologies. The paths outlined in Elkins-Tanton et al. (2003) and Stauffer and Butler (2010) are not disputed. These works add to the understanding of primary morphology formation. The absence of biconcave/toroidal forms in medial and distal assemblages strongly suggests that these less stable morphologies are not primary morphologies, not even in the proximal setting. Initial rolling may have resulted in transient biconcave forms, but it is suggested that perturbations or tumbling motions were present in all tektites. Any rolling motion would be acted against by drag. These discoidal and biconcave forms would have evolved, with the aid of surface tension, back to more stable spherical, prolate spheroidal forms and spheroidal dumbbells (evolving to teardrops). Thus, it is considered that only the more stable morphologies were present at the ‘end’ of the primary formation stage. It is considered by the author that the basic assemblage for proximal, medial and distal tektites (all tektites) is the traditional view. The primary forms basically comprised spheres, variably prolate spheroids, spheroidal dumbbells and spheroidal apioids. It is argued that the principal flattening forces were deceleration and aerodynamic forces, with shear forces creating internal vortices. Only these forces produce the range of observed tektite morphologies. Rolling probably plays little, or more likely no, role in the formation of the final flattened ‘exit’ morphologies. These data explain why distal australites have cascaded to form typically small ellipsoidal to nearly spherical ‘exit’ morphologies (Whymark, 2012). Medial philippinites produce often large spherical (probably forming at higher altitudes) to biconvex (corresponding to lower altitudes) ‘exit’ morphologies. Proximal indochinites, forming at significantly lower altitudes and therefore having the greatest atmospheric interaction, exhibit the greatest plastic deformation, producing common ellipsoidal, biconvex, concavo-convex and biconcave discoidal forms. Unstable tori always fragment. Baumann et al. (1992) state that vortex rings are unstable and will expand rapidly, which is a universal characteristic of instability. Primary shapes, shown in Figures left, are considered to be the initial shape formed from the melt prior to interaction with the atmosphere. The primary tektite morphologies identified in this web page remain largely unaltered from the work of Cleverly (1986). This ensures consistency when we review the classification scheme. It is considered that true primary shapes in tektites are, for the most part, transient in nature. It appears that almost all tektites were disrupted within the atmosphere, albeit typically at high altitude, having traversed the denser lower atmosphere. As a consequence of disruption within the atmosphere they are immediately and contemporaneously plastically deformed. Australites are always cited as exhibiting a very clear primary shape formation stage as shown in the figures below, with the primary shape probably existing for minutes prior to atmospheric interaction and modification during re-entry. The author disputes this assumption and this subject is discussed further in the plastic deformation chapter. The majority of philippinites show clear evidence that the primary morphology was transient with only a small percentage of bodies appearing to be primary in the re-entry phase. Indochinites formed at lower atmospheric levels and the primary form is truly transient, commonly evolving into discoidal bodies through atmospheric interaction. In the latter stages of impact some indochinites, together with the layered tektites, are too viscous and low temperature, or cool too rapidly, to form symmetrical/spherical primary morphologies. A true primary body is always spherical in cross section. 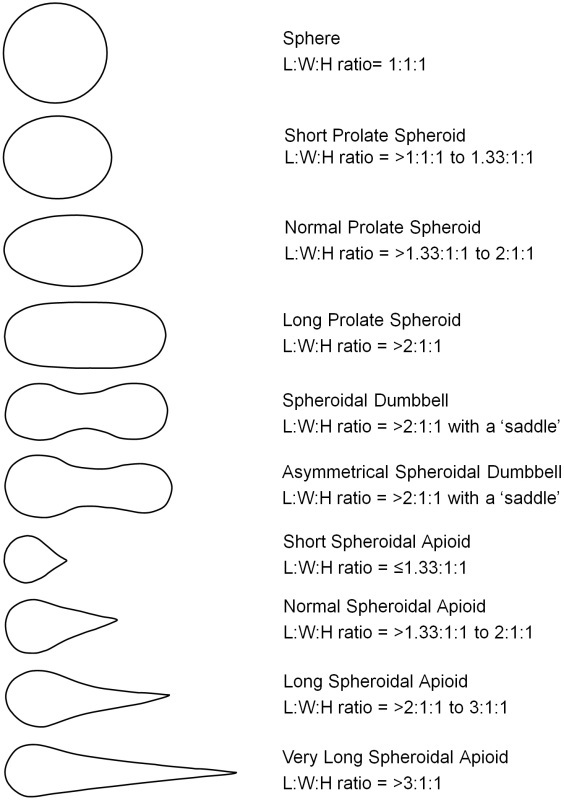 Spheres, short prolate spheroids, long prolate spheroids, spheroidal dumbbells and spheroidal teardrops. As soon as the body is off-spheroidal in cross section then one is looking at a modifies secondary body. ABOVE: The primary tektite morphologies are all spheroids. A spherical cross section is always found perpendicular to the long axis. From top to bottom: Sphere, short prolate spheroid, long prolate spheroid, spheroidal dumbbell, spheroidal teardrop. (Grey area is a spheroidal cross section; dashed lines are the long axes. Oriented in stable re-entry pattern). ABOVE: An oblate spheroid. This is not considered a primary morphology as the cross section perpendicular to the long axes is an ellipsoid. The spheroidal cross section runs perpendicular to the short axis. This is a secondary morphology formed when molten spheres are flattened due to atmospheric interaction. The primary morphology was a sphere. (Grey area is a spheroidal cross section; dashed lines are the equal long axes; dotted line is the short axis. Oriented in stable re-entry pattern). The primary morphologies have been numerically defined as outlined in the table and figure below. This is largely based on the work of Cleverly (1986). ABOVE: The definition and nomenclature of primary tektite morphologies. Based on Cleverly (1986). See Right for a diagrammatic representation. RIGHT: A diagrammatic representation of primary tektite morphologies. Based on Cleverly (1986). The ratio of different morphologies is not consistent across the whole of the Australasian strewn field. For a given chemical composition, a higher temperature ‘runny’ melt, with the longest liquid life, is likely to produce more spherical forms (Chapman D. R., 1964). LEFT: The primary morphology varies dependent on the glass viscosity at the time of break-up. Glass was ejected from a tube 34 m high at various viscosities. The forms had solidified before hitting the ground. At 35 Poise (more viscous) mainly teardrops were formed. At 0.8 poise (less viscous) almost all spheres were produced. 2.8 poise produced a similar assemblage to primary shapes in southeast Australia. Image Credit: Chapman (1964). NASA document #TM X-54, 004. The australites were the first formed tektites, ejected with the highest inherited velocities and highest melt temperature, disrupted at high atmospheric levels (reducing conductive cooling). The long liquid life allowed australites to cascade into smaller bodies, presumably as the melt droplets interacted with the highest reaches of the atmosphere during ejection. Consequently, australites are predominantly small forms that originally had predominantly spherical shapes. Teardrops and dumbbells are relatively rare. Philippinites are intermediate between the australites and indochinites, but in terms of primary shapes they tend to be medium to large in size and typically originally spherical, with non-spherical primary forms making up only a small percentage of specimens. Dumbbells are not common, but not unusual, whereas true teardrops are exceedingly rare in philippinite collections. Again, this is attributable to the melt being relatively high temperature and being ejected with a relatively high velocity and an angle that allowed philippinites to form at high atmospheric levels, with a small part of the assemblage effectively forming in ‘space’. The larger size of philippinites, when compared to australites, is probably attributable to a slightly more viscous lower temperature melt, that traversed the atmosphere (which acts upon the melt droplet) quicker due to a higher ejection angle and still reasonable velocity. Elongated forms, dumbbells and (often very elongated) teardrops are found in abundance in Indochina, sensu lato. This is typical of a low temperature, viscous melt. Transient, non-equilibrium, morphologies, such as teardrops, are ‘locked-in’ as the tektite cools and surface tensions of the very viscous melt resist the external forces. For many indochinites the primary morphology was a transient phase. Atmospheric interactions immediately distorted the morphology into flattened discs and onion-forms. It could be argued that the morphologies that are distorted by atmospheric interaction are also primary morphologies as they formed whilst molten, but it is simpler to describe alterations to the tektite by atmospheric interaction as secondary plastic deformation modifications to the basic primary tektite shapes. In the distal and medial realms most tektite morphologies can easily be assigned to an original primary or slightly plastically deformed primary form. Some fragments may be indistinguishable due to weathering and transportation processes. In the proximal setting one can identify plastically deformed primary morphologies. One can also identify amorphous blocky layered Muong Nong-type impact glasses. These layered forms represent the most viscous, lowest temperature melts. They are incompletely homogenised and may contain relict crystal grains. These bodies were too viscous to form discrete tektite droplets and can effectively be considered as ‘collapsed’ parts of the impact melt sheet. Less discussed, are the array of indochinites between the perfect, often plastically deformed, primary morphologies (see Figure 7.6) and the blocky amorphous Muong Nong-type layered impact glasses (see Figures 7.9 and 7.10). Often only perfect morphologies make it into collections. In the Indochinese area many imperfect, often bubble-rich, forms exist (see Figures 7.7 and 7.8). The glass is fully melted and homogenised tektitic glass, but the spherical morphologies have failed to form (see Figure 7.8). These specimens are akin to the 35 poise (viscous melt) forms in the top left of Figure 7.5. These bodies represent disruption of the melt sheet, but at lower energy levels. The lower temperature melt is solidifying before it even moves towards an equilibrium form. These assemblages with amorphous bubble-rich tektites (often with large circular bubbles or many elongate ‘stretched’ bubbles - see Figures 7.7 and 7.8) and twisted and contorted forms are indicative of proximity to the source crater. Similar forms can be found from the unrelated 1.2 km diameter Mt Darwin Crater in Tasmania, Australia, and 14 km diameter Zhamanshin Crater in Kazakhstan. The ejecta from these impacts is characterised by layered impactites, bubble-rich forms, specimens with stretched bubbles, commonly contorted forms and rare small splashform type impactites that grade towards true tektites. Similar proximal ejecta is found in the Central European 'Moldavite' strewn field. 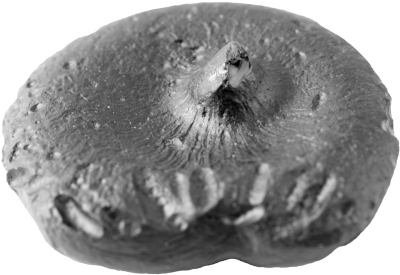 FIGURE 7.6: Three typical indochinites splashform tektites. Symmetrically shaped tektites become more prominent in the assemblage with distance from the impact. These forms have been plastically deformed. Left: A 51.6 gram (46x42x20 mm) indochinite disc from unknown locality. No catalogue number. Middle: A 43.3 gram (67x28x28 mm) teardrop indochinite from Yen Bai Province in Vietnam (Catalogue # IV1112355). Right: A 42.5 gram (68x23x22 mm) dumbbell indochinite from Yen Bai Province in Vietnam (Catalogue # IV1112386). FIGURE 7.7: Proximal tektites are often bubble rich. In medial and distal tektites similar large bubbles may be found, but become much rarer. Left: A 41.2 gram (51x37x26 mm) broken bubble indochinite from Yen Bai Province in Vietnam (Catalogue # IV1112405). Right: A 43.3 gram (42x38x26 mm) tektite from Yen Bai Province in Vietnam (Catalogue # IV1112412). FIGURE 7.8: Proximal tektites commonly display small stretched extensional bubbles, indicative of a viscous melt. These small stretched bubbles may occur in splashform teardrops, but also commonly occur in amorphous or sometimes contorted bodies. Medial tektites rarely display this morphology. This morphology is absent in distal forms. These forms, which comprise wholly of 100% melted glass and often display some hint of morphology are considered true tektites, although it is clear they are lower energy specimens trending towards Muong Nong-type layered impact glasses. Left: A 10.2 gram (55x19x11 mm) indochinite from unknown locality. (No catalogue number). Right: A 8.1 gram (45x17x10 mm) indochinite from unknown locality. (No catalogue number). FIGURE 7.9: Proximal Muong Nong-type layered impact glasses. These clearly display layers of pure tektitic glass and bubble-rich lighter layers, which are better termed impact glasses. Layered impact glasses occur only in the proximal setting and are true indicators of proximity to the impact site. Left and right: A 93.0 gram (74x49x27 mm) Muong Nong-type layered impact glass from unknown locality in Indochina (Catalogue # IX1112730). FIGURE 7.10: A large 1,028 gram (122x94x79 mm) proximal Muong Nong-type layered impact glass from unknown locality in Laos (Catalogue # IL1117160). The unshaped tektites of Muong Nong (note that Muong, meaning town/district, is also variously spelt Mouang, Muoang, Muang, Mueang and Mong, with Muang appearing to be the correct spelling in Laos), were first described by Lacroix (1935). The term Muong Nong-type tektite was popularised by Barnes (1961). In this website the term Muong Nong-type layered impact glass is favoured for the same (maintaining the usage of the historic Muong Nong term). Muong Nong-type layered impact glass is transitional and genetically linked to 'splash-form' tektites: Chemically they are very similar. The key difference is that Muong Nong-type layered impact glass '...seem to have experienced a lower peak temperature and pressure, thus preserving the precursor material much better than the splash forms do' (Koeberl, 1986). Muong Nong-type layered impact glasses are typically blocky. Fiske (1996) decribes large fragments as being surrounded by smaller ones. Larger fragments fit together whilst smaller fragments have one major fracture surface and were probably exfoliated from the larger block. Fragments he studied appeared to be 'potato'-like blocks when reconstructed and not flat puddles. Alternating dark (silica-rich) and light (reduced silica) layers are seen in Muong Nong-type layered impact glasses (Koeberl, 1985). Koeberl (1992) identifies the key differences between Muong Nong-type layered impact glasses and splash-form tektites as '1) higher concentrations of volatile elements (e.g. Cl, Br, Zn, Cu, Pb); 2) chemically inhomogenous on a millimeter scale; 3) having dark and light layers with different chemical compositions; 4) may contain relict mineral inclusions; 5) large and more abundant bubbles; 6) large and irregular size'. Within the Australasian strewn field Muong Nong-type layered impact glasses are found in mid-southern Laos, eastern Thailand, mid-southern Vietnam, northern Cambodia and Hainan, with the odd occurrence in northern Laos and northern Vietnam. The area typified by the Muong Nong locality in Savannakhet Province, but inclusive of a larger area in southern Laos and the southern part of eastern Thailand is dominated by these Muong Nong-type layered impact glasses in the absence or near absence of splashform tektites (Schnetzler,1992; Schnetzler and McHone, 1996). Trnka (pers. comm., 2013), however, informs the author that splashform tektites can be found across this area alongside Muong Nong-type impact glass. Schnetzler (1992) and Schnetzler and McHone (1996) offer an excellent overview of the distribution pattern and are well worth refering to in this discussion. The distrubution of layered impact glasses helps to pin-point the source crater. Taking a SW-NE transect the crater should be centrally placed between the two extremities. The smaller area in Schnetzler and McHone (1996) in which only (or mainly) layered tektites exist indicate the source crater is nearby. Layered tektites are the lowest temperature, last formed, glasses. ABOVE: The distribution of Muong Nong-type layered impact glasses and intermediate types in the Indochinese and Chinese region. After Schnetzler et al. (1992). ABOVE: According to Schnetzler and McHone (1996) only Muong Nong-type layered impact glasses occur in this region, in the absence of splashform tektites, although this has been disputed. In addition to the aforementioned confirmed Muong Nong-type layered impact glass localities it is noteworthy that Chapman and Scheiber (1969) list and figure Muong Nong-type layered impact glasses from Kubao (Cubao) in Metro Manila and Babuyan, Zambales Province of the Philippines. The author, despite having an extensive collection of philippinites cannot confirm their presence. Having recently acquired c. 470 bags of material from the Beyer collection (encompassing tektites, obsidian, so-called americanites (obsidian) and so-called pseudo-tektites (obsidian)) this will be a future area of study. To my knowledge no large Muong Nong tektites have been recovered in the Philippines. One would not expect to observe true Muong Nong-type tektites in the Philippines, although transitional forms may exist. I have heard rumours of one larger Muong Nong-type layered impact glass from the Philippines (not examined), but have reason to believe that it is from Indochina. Other possibilities have always proven to be obsidian. Muong Nong-type layered impact glasses have been recorded in other known strewn fields, some perhaps transitional in nature. In the Central European strewn field Muong Nong-type moldavites were first described by Rost (1966). In the North American strewn field a layered bediasite was analysed by Wittke and Barnes (1988) and a layered georgiaite described by Povenmire et al. (1994) and analysed by Glass et al. (1994). In the Central American strewn field a layered tektite was recently recovered and descibed by Cornec et al. (2013). The nature and origin of Muong Nong-type layered impact glasses is often the subject of confusion, paralleling (and being derived from the same sources) as the lunar origin vs. terrestrial origin of tektites historic argument. Barnes (1964) identified detrital mineral grains in Muong Nong-type layered impact glasses. He also identified angular 'bubbles' that he believed represented residual pore spaces in source material that barely melted. Barnes (1964) concluded that layered tektites were likely formed in puddles by flash fusion of exposed patches of soil and rock. O'Keefe and Lowman (1965) first suggested that Muong Nong-type impact glasses may be lunar ash flows ejected from the moon by impact. O'Keefe and Adler (1966) concluded that the angular voids of Barnes (1964) in Muong Nong-type layered impact glasses were, in fact, derived from fragmental (or clastic grains of) glass of lunar origin, i.e. a lunar welded tuff. O'Keefe (1966) concludes that a 100,000 ton 'fragment' of this lunar welded tuff was ejected from the moon by meteoritic impact (to account for the presence of coesite). In O'Keefe (1969) the suggestion was made that Muong Nong tektites comprised welded microtektites. Isolated microtektites were interpreted as representing the unwelded component of the lunar ash flow. Following analyses of returned lunar samples from the Apollo missions, a lunar origin for tektites, including microtektites and Muong Nong-type layered impact glass, could be ruled out on geochemical grounds (Taylor, 1973). Gasparis et al. (1975) further supported a terrestrial origin with natural remanent magnetism suggesting that tektites cooled on the Earth's surface, supporting a 'puddle' origin. Futrell, however, continued to insist on a lunar volcanic origin (and volcanic ejection) for tektites from 1977 to his death in 2001. He followed O'Keefe's work, insisting on a Muong Nong-type impact glass being a lunar welded tuff incorporating microtektites. Preuss and Pohl (1989) and Preuss et al. (1989) reinforced the view that Muong Nong-type impact glass comprised welded microtektites, yet offered no evidence in describing what appeared to be clastic grains. There is abundant evidence of detrital grains, including zircon, rutile, monazite, chromite and quartz (Glass, 1970 and 1972). Yet, in all the microtektite welded tuff papers no evidence is offered for the presence of microtektites beyond their being rounded grains. Koeberl (1992, and his reply to Futrell in 1993) eloquently run through the evidence for the origin of Muong Nong-type layered impact glasses and anyone considering a lunar welded tuff origin should consult these definitive articles. Huber (2008) eliminated the final obstacle in the origin of Muong Nong-type layered impact glasses. He demonstrated that the chemistry of the Muong Nong-type layered impact glasses was not related to the adjacent soils, i.e. they did not form in situ and were therefore airborne ejecta. This supported previous work such as Glass and Koeberl (1989) that Muong Nong-type layered impact glasses were derived from a single, slightly heterogeneous, source. Airborne ejecta might encompass two possible origins for Muong Nong-type layered impact glasses: As ejecta somewhat akin to volcanic bombs (Fiske, 1996) and impact related flädle or as a pyroclastic base surge deposit. Little evidence exists for the base surge deposit or terrestrial welded tuff. Muong Nong-type layered impact glasses only very superficially resemble welded tuffs. Koeberl (1993), in response to Futrell's assertations that Muong Nong-type layered impact glasses resemble terrestrial volcanic glasses writes: 'It is certainly true that these glasses look similar to the unaided eye, just like a cut zircon might be mistaken for a diamond by unsuspecting jewelry buyers'. Also against a base surge deposit is the presence of folded layers, which would not be expected in such deposits. Below ambient atmospheric bubble pressures, recorded by Müller and Gentner (1968) and Mizote et al. (2003), also indicate that bubbles formed in specimens at altitude and not on the ground as would be expected with a base surge deposit. In conclusion, Muong Nong-type layered impact glasses almost certainly represent large 'bomb' like ejecta (Fiske, 1996) from a single impact event into a slightly heterogeneous source rock (Glass and Koeberl, 1989). The work of Klein et al. (1980) support this with the statement '...Moung Nong material can be formed as a glass having dimensions appreciably larger than the usual samples and that sintering or agglomeration of smaller particles of the material is not required to produce bodies of the observed size.' The work of Fiske (1996) indicates a lava bomb-like origin as oppose to a puddle origin. Composition, including relict mineral grains support this material being melted sedimentary rock (Glass, 1970 and 1972). Folding of layers is highly consistent with a 'bomb'-like origin. Bubble pressures also support this origin. With reference to Gasparis et al. (1975) it seems probable that these 'bombs' landed as hot, although probably rigid, bodies and cooled on the Earth's surface. They subsequently fragmented into blocky bodies which are found today. So, Muong Nong-type layered impact glasses are simply large 'tektites' that, compared to 'splash-form' tektites, experienced a lower peak temperature and pressure (Koeberl, 1986). ABOVE: Two images of a folded Muong Nong-type layered impact glass from Indochina (Laos or NE Thailand). Aranyosi A. J. 2010. Calculating the velocity of gravity- and capillarity-driven flow. Massachusetts Institute of Technology, USA. pp.3. Barnes V. E. 1964. Terrestrial implications of layering, bubble shape and minerals along faults in tektite origin. Geochimica et Cosmochimica Acta. 28: 1267-1271. Barnes V. E. 1961. A world-wide geological investigation of tektites. Geotimes. (American Geological Institute). 6 (2): 8-12, 38. Baumann N., Joseph D. D., Mohr P., Renardy Y. 1992. Vortex rings of one fluid in another in free fall. Physics of Fluids A. 4 (3): 567-580. Brown R. A., Scriven L. E. 1980. The shape and stability of rotating liquid drops. Proceedings of the Royal Society of London Series A. 371: 331-357. Butler S. L., Stauffer M. R., Sinha g., Lilly A., Spiteri R. J. 2011. 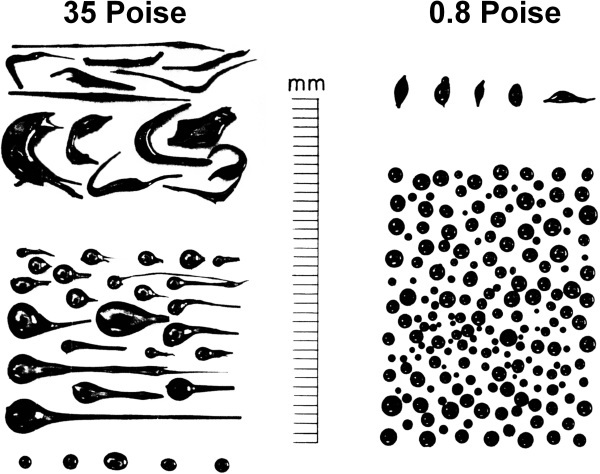 The shape distribution of splash-form tektites predicted by numerical simulations of rotating fluid drops. Journal of Fluid Mechanics. 667: 358-368. Chapman D. R. 1964. On the unity and origin of the Australasian tektites. Geochimica et Cosmochimica Acta. 28 (6): 841-880. Chapman D. R., Scheiber L. C. 1969. Chemical investigation of Australasian tektites. Journal of Geophysical Research. 74 (27): 6737-6776. Cleverly W. H. 1986. Australites from Hampton Hill Station, Western Australia. Journal of the Royal Society of Western Australia. 68 (4): 81-93. Collins G., Melosh H. J., Marcus R. 2005. Earth Impacts Effects Program: A web-based computer program for calculating the regional environmental consequences of a meteoroid impact on Earth. Meteoritics & Planetary Science. 40 (6): 817-840. Cornec J., Cornec L., Povenmire H. 2013. A Layered Tektite from the Central American Strewn Field. Abstracts of the Lunar and Planetary Science Conference. 44th: Abstract #1123. Elkins-Tanton L. T., Aussillous P., Bico J., Quéré D., Bush J. W. M. 2003. A laboratory model of splash-form tektites. Meteoritics & Planetary Science. 38: 1331-1340. Fiske P. S. 1996. Constraints on the formation of layered tektites from the excavation and analysis of layered tektites from northeast Thailand. Meteoritics & Planetary Science. 31: 42-44. Gasparis A. A. de, Fuller M., Cassidy W. A. 1975. Natural remanent magnetism of tektites of the Muong Nong-type and its bearing on models of their origin. Geology. 3 (10): 605-607. Glass B. P. 1970. Crystalline inclusions in a Muong Nong-type tektite. Meteoritics. 5: 199-200. (Abstract). Glass B. P. 1972. Crystalline inclusions in a Muong Nong-type Indochinite. Earth and Planetary Science Letters. 16: 23-26. Glass B. P. 2003. Australasian microtektites in the South China Sea: implications regarding the location and size of the source crater. Abstracts of the Lunar and Planetary Science Conference. 34th: Abstract #1092. Glass B. P., Koeberl C. 1989. Trace element study of high- and low-refractive index Muong Nong-type tektites from Indochina. Meteoritics. 24: 143-146. Glass B. P., Koeberl C. 2006. Australasian microtektites and associated impact ejecta in the South China Sea and the Middle Pleistocene supereruption of Toba. Meteoritics & Planetary Science. 41 (2): 305-326. Glass B. P., Koeberl C., Povenmire H. 1994. Composition and petrography of a Muong Nong-type Georgia tektite. Abstracts of the Lunar and Planetary Science Conference. 25th: 427-428. Heine C. J. 2006. Computations of form and stability of rotating drops with finite elements. IMA Journal of Numerical Analysis. 26 (4): 723-751. Hills R. J. A., Eaves L. 2008. Polygonal excitationsof spinning and levitating droplets. Physics Review Letters. 101: 234501. Huber H. J. 2008. INAA of Muong-Nong type tektites and adjacent soil samples. SAAGAS 22: 22nd Seminar Activation Analysis and Gamma-Spectroscopy Program and Book of Abstracts. 35. (Abstract). Klein L. C., Yinnon H., Uhlmann D. R. 1980. Viscous flow and crystallization behavior of tektite glass. Journal of Geophysical Research. 85: 5485-5489. Koeberl C. 1985. Geochemistry of Muong Nong-type tektites VII: chemistry of dark and light layers - first results. Abstracts of the Lunar and Planetary Science Conference. 16th: 449-450. Koeberl C. 1986. Muong Nong-type tektites from the moldavite and North American strewn fields? Journal of Geophysical Research. 91 (B13): E252-E258. Koeberl C. 1992. Geochemistry and origin of Muong Nong-type tektites. Geochimica et Cosmochimica Acta. 56 (3): 1033-1064. Koeberl C. 1993. 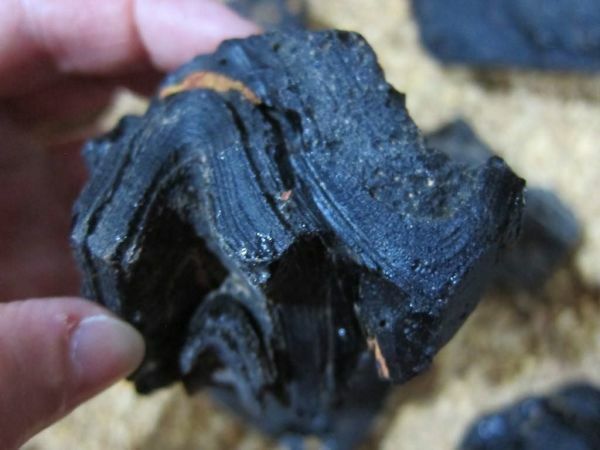 Reply to the comment by D. S. Futrell on 'Geochemistry and origin of Muong Nong-type tektites'. Geochimica et Cosmochimica Acta. 57: 4531-4532. Lacroix A. 1935. Les tectites sans formes figurées de l'Indochine. (=The unshaped tektites of Indochina). Comptes Rendus de l'Académie des Sciences, Paris. 200: 2129-2132. Also in Barnes, V. E. and Barnes M. A. (Eds.) 1973. Benchmark Papers in Geology: Tektites. Dowden, Hutchinson & Ross, Inc.
Lautrup B. 2010. Chapter 5: Surface Tension. Physics of Continuous Matter. 69-94. Lee M. Y., Wei K. Y. 2000. Australasian microtektites in the South China Sea and the West Philippine Sea: implications for age, size and location of the impact crater. Meteoritics & Planetary Science. 35 (6): 1151-1155. Lü Y. J., Xie W. J., Wei B. 2010. Multiple-lobed bifurcation of rotating liquid drops levitated by ultrasound. Journal of Applied Physics. 107: 014909. pp.8. Lutgens F. K. and Tarbuck E. J. 1995. The Atmosphere. Prentice Hall, 6th ed. 14-17. Ma P., Aggrey K., Tonzola C., Schnabel C., de Nicola P., Herzog G. F., Wasson J. T., Glass B. P., Brown L., Tera F., Middleton R., Klein J. 2004. Beryllium-10 in Australasian tektites: constraints on the location of the source crater. Geochimica et Cosmochimica Acta. 68: 3883-3896. Matsuda J., Maruoka T., Pinti D. L., Koeberl C. 1995. A Philippinite with an unusually large bubble: gas pressure and noble gas composition. Meteoritics. 30 (5): 542. (Abstract). McColl D. H. 1997. A flanged toroidal tektite from Australia. Meteoritics & Planetary Science. 32 (6): 981-982. McColl D. H. 2008. Tektite bubbles from Australia. Meteorite Magazine. 14 (2). 40-42. McDonald J. E. 1954. The shape and aerodynamics of large raindrops. Journal of Meteorology. 11: 478-494. Melnik W. L. 1991. Ablation of Australian tektites, supportive of a terrestrial origin? 54th Annual Meeting of the Meteoritical Society, Abstracts: 153. Repeated in: Meteoritics. 26 (3): 71. Mizote S., Matsumoto T., Matsuda J., Koeberl C. 2003. Noble gases in Muong Nong-type tektites: their implication. Meteoritics & Planetary Science. 38 (5): 747-758. Müller O., Gentner W. 1968. Gas content in bubbles of tektites and other natural glasses. Earth and Planetary Science Letters. 4: 406-410. O'Keefe J. A. 1966. The origin of tektites. Space Science Review. 6 (2): 174-221. O'Keefe J. A. 1969. The microtektite data: Implications for the hypothesis of the lunar origin of tektites. Journal of Geophysical Research. 74 (27): 6795-6804. O'Keefe J. A., Adler I. 1966. Lunar structures as deduced from Muong Nong tektites. National Aeronautics and Space Administration (United States Federal Government). NASA TN D3564: 12 pages. Also: Proc. Caltech. JPL Lunar and Planetary Conf. Sept. 13-18, 1965, p. 92-101. O'Keefe J. A., Lowman P. D. Jr. 1965. Tektites as a guide to the structure of the Moon. Tectonophysics. 2 (4): 319-332. Plateau, J. A. F. 1873. Statique Experimentale et Theorique des Liquides Soumis aux Seules Forces Moleculaires. Gauthier-Villars, Paris. Povenmire H., Glass B. P., Strange R. L. 1994. 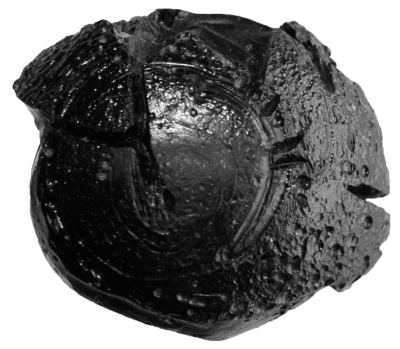 Discovery and description of a Muong Nong-type Georgia tektite. Abstracts of the Lunar and Planetary Science Conference. 25th: 1101-1102. Preuss E., Pohl J. 1989. Microtektites in Muong Nong tektites. 52nd Annual Meeting of the Meteoritical Society: 200. Preuss E., Pohl J., Fehr T., Rose D. 1989. Microtektites in Muong Nong tektites. Meteoritics. 24: 317. (Abstract). Rost R. 1966. A Muong Nong-type moldavite from Lhenice, in Bohemia. Acta Universitatis Carolinae, Geologica. 4: 235-242. Schnetzler C. C. 1992. Mechanism of Muong Nong-type tektite formation and speculation on the source of Australasian tektites. Meteoritics. 27: 154-165. Schnetzler C. C., McHone J. F. 1996. Source of Australasian tektites: investigating possible sites in Laos. Meteoritics & Planetary Science. 31: 73-76. Stauffer M. R., Butler S. L. 2010. The shapes of splash-form tektites: Their geometric analysis, classification and mechanics of formation. Earth Moon and Planets. 107 (2): 169-196. Suess H. E. 1951. Gas content and age of tektites. Geochimica et Cosmochimica Acta. 2 (1): 76-79. Tagg R., Cammack L., Croonquist A., Wang T. G. 1980. Rotating liquid drops: Plateau's experiment revisited. Jet Propulsion Laboratory Publication, 80-66. pp.72. Taylor S. R. 1973. Tektites: a post Apollo view. Earth-Science Reviews. 9: 101-123. Thomson J. J., Newall H. F. 1885. On the formation of vortex rings by drops falling into liquids, and some applied phenomena. Proc. R. Soc. London. 29: 417-436. Whymark A. 2012. Were Australian Tektites Plastically Deformed Prior to Re-Entry? Abstracts of the Lunar and Planetary Science Conference. 43rd: Abstract #1045. Wittke J. H., Barnes V. E. 1988. Multi-component source for Muong Nong-type Bediasite 30775-2. Meteoritics. 23: 311. (Abstract). Zähringer J., Gentner W. 1963. Radiogenic and atmospheric argon content of tektites. Nature. 199 (4893): 583.